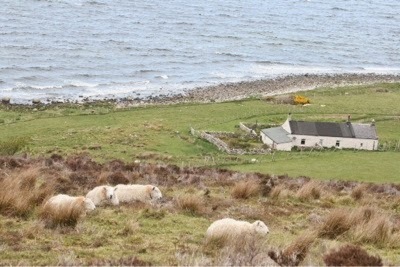 We're on Arran this week, the beautiful Hebriddean island in the Forth of Clyde. In the queue for the ferry I got talking to a farmer hauling a trailer with three young beef cows that he hoped would each priduce a calf next year. He was bemoaning the fact that there is no longer an abattoir on the island meaning they must take animals the twenty four mies to John Scott's at Paisley. He explained that Scott's is a good abattoir where the animals are handled confidently and the killing process is quick and efficient. The problem was he wanted the animals to travel as short a distance as possible. As consumers we get to choose who gets our money. 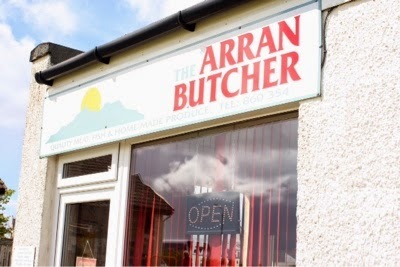 For tonight's tea we had meat from The Arran Butcher, raised locally and killed at Scott's abattoir. I could have bought meat from the Co-Op in Brodick: plastic wrapped in a factory hundreds of miles away, from one of those poor creatures we saw being hauled up the motorway. As consumers we are not passive in our relationship with food producers, we have the power to make a decision about who we want to raise and slaughter the animals we eat. Supermarkets sanitise the whole process of meat production and encourage us to not think about where it comes from. It's about time we realised we have power to influence the way food is produced and used our spending power wisely to support people who produce it in ways we like.